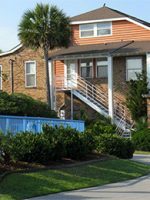 Wild Dunes Resort is on the furthermost tip of Isle of Palms, a laid back and beautiful barrier island off the South Carolina coast about a half-hour’s drive from historic Charleston. With the Atlantic Ocean bordering one side and the Intracoastal Waterway on the other, this 1,600-acre year-round beach resort offers lots of family-friendly activities, including watersports, games and crafts, tennis, golf, biking and eco-oriented adventures that allow you to explore the area’s intriguing ecosystem. The list of summer programs (including all sorts of kids’ camps and sports clinics) is about a mile long, each option sounding more inviting than the next. And if you’re visiting on a holiday — whether it’s July 4 or the Christmas season — special programs and offerings themed to that holiday abound. 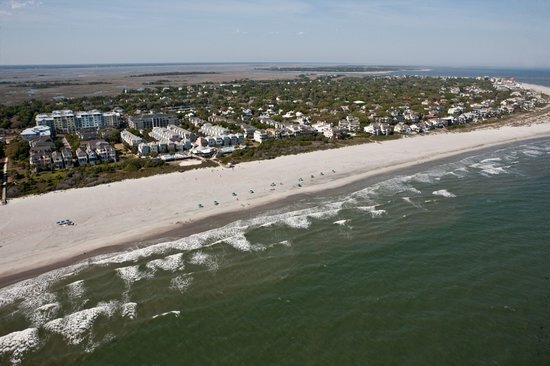 This sprawling resort encompasses several types of accommodations, including a 93-room hotel called the Boardwalk Inn, more than 350 one- to four-bedroom villas and three- to 11-bedroom homes, and 120 guestrooms and suites in the fairly new Village at Wild Dunes — the best accommodation for most families. Opened in 2008, the modern, bright, beach-themed Village offers both concierge and housekeeping service to all guests who stay in its hotel-like guestrooms, studios and suites. Both the studios (which have kitchenettes) and the one-, two- and three-bedroom suites (which have full kitchens) have washer/dryers. Resort amenities include beach access, a variety of restaurants and snack bars (from fine dining to deli take-out), several swimming pools, a fitness center, two golf courses, 17 tennis courts, a spa, miles of walking and jogging paths and valet parking. There are plenty of accommodation options at Wild Dunes, ranging in size, comfort level, and price. Stay in one of the 93 rooms of the Boardwalk Inn for an experience that's more low-key, but still beautiful and comfortable. Newly renovated in 2016, the rooms feature old-fashioned decor with modern conveniences. Families with a higher budget to work with can spring for a one- to four-bedroom condo/cottage, or massive vacation homes with up to seven bedrooms. Specific details for these vary based on the property. Daily housekeeping service also takes care of the dishes if you happen to leave them, although dishwashers are included even in the kitchenettes. All accommodations have flat-screen cable televisions, Wi-Fi access, private balconies, guest robes, hair dryers and daily newspaper delivery. All the rooms are non-smoking and valet parking is free for everyone. Note: A resort services fee is added to the bill. Sea Grove 10D - AWESOME! The location of this unit was perfect! Beach access, pool right there, Boardwalk & Grand Pavilion right there while being very private. 3 Bedrooms each with their own EnSuite bath! Highly Recommend!! Everything you need for a wonderful beach/Charleston trip. Wild Dunes offers so many diverse activities, including a full menu of family-oriented options, that it's impossible to do it all -- or even a fraction of what is available. Here's a general outline of what you'll find. Note that most (but not all) of the organized activities require a separate fee and making reservations at least a day in advance is always recommended to guarantee your space in the high season and to assure adequate participation to hold the event in the off-season. Wild Dunes is located right on a 150-yard-wide, family-friendly sandy beach that's great for swimming, building sand castles, playing beach games, sunning and shelling (you can occasionally find whole sand dollars if you look hard enough at low tide). Surf lessons (both private and semi-private) are available at the resort, and if you didn't happen to bring your own, you can rent boogie boards, skim boards, surfboards and beach chairs with umbrellas. Wild Dunes features two 18-hole, 70-par golf courses (the Harbor Course, where you play from island to island in the intracoastal waterway, and the spectacular oceanfront Links Course) that were both designed by Tom Fazio and are consistently ranked among the best in the United States. Individual golf lessons and group golf clinics are offered for adults and children ages 8 to 16. The Fazio Junior program allows children ages 16 and under to play 18 holes of golf for a nine-hole rate after 11 a.m. if accompanied by a paying adult. The Family Evening Golf program allows one child age 16 and under to play free per paying adult after 5 p.m. The resort also offers 17 Har-tru tennis courts (five of which are lit for night play and one of which offers stadium seating) and gives guests a complimentary hour of tennis per hotel room or condo unit, per day (based on availability) from noon through 6 p.m. Tennis lessons and clinics are available year round (including kids' programs for ages 4 and up), as well as an extensive summer tennis program. Wild Dunes is also the first resort on the east coast to offer beach tennis, a doubles game using pressureless tennis balls on a beach volleyball court. Five miles of walking/jogging trails wind through the resort, which also offers a great bike rental program. You can rent junior and adult bikes, tandem bikes and trailers (as well as baby jogger bikes for runners) by the hour, half-day, full-day, multi-day or week. You'll find the bike rental facility near the tennis center. Note: The sand is hard packed enough near the water during low tide to ride your bikes on the beach. The Go Wild Crafts and Adventure program provides hour-long activities (like Bingo, tye-dying T-shirts, making family stepping stones, treasure hunts and more) for kids to do with their parents. The program is available year-round, although the number of options is greatest in summer. The award-winning Island Adventures program includes seasonal day camps (with different themes, like sports, eco adventures or water adventures) for kids ages 3 to 12, family beach and sporting games, teen programs and Wild Excursions (nature exploration trips and nature-related programs). Wild Excursions cover more than a dozen options during the height of summer (and less during the rest of the year) and include things like exploring the ecosystem of the barrier islands by pontoon boat or kayak, taking a sunset cruise over the marshes with a naturalist to look for bottlenose dolphins and loggerhead sea turtles, going creek fishing or crabbing with a lowcountry guide, or joining a sunset sail aboard either a catamaran or the resort's 50-foot yacht. Note: The resort provides transportation for most activities that meet off-site. During the season, free resort offerings include a Monday night tennis exhibition, Village Idol karaoke contests, movies on the Village plaza (all G- or PG-rated) two nights a week, free shag (South Carolina's official dance) lessons, a DJ at the Grand Pavilion on Saturday nights, and black light dodgeball and black light volleyball for teens and 'tweens ages 10 and up. The resort's more upscale restaurant, (temporarily operating out of The Lettered Olive & Lounge while the Boardwalk Inn location undergoes renovations through April 2016), has a kids' menu that shows the chef has put some serious thought into offering interesting and healthy fare for the under-12 crowd. The kids' menu includes grilled beef tenderloin as well as old standbys such as chicken fingers and cheese ravioli, as well as inventive options like Squidword Fish Sticks (baked halibut), California Farm Lettuce Salad (lettuce with apple, cherries and almonds and an orange vinaigrette dressing), and melon "fries" with strawberry "ketchup." Adults will be similarly charmed with the regular menu. While seafood is definitely the specialty here (crab crusted grouper and grilled South Carolina swordfish are among the choices), the all-natural filet of beef melts in your mouth and would far exceed most diners' expectations for any upscale steak house. You can choose to eat indoors or outside on the patio overlooking the pool. The restaurant is open year-round, but hours and meals offered vary with the season. 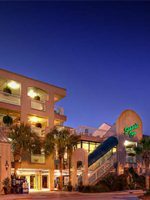 Located on the Village Plaza and named for the state seashell, this is the resort's more casual, family-friendly eatery, with both indoor and patio seating. 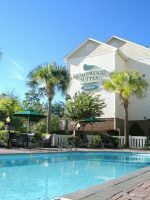 It's open seasonally for breakfast and dinner, serving both meats and seafood with an emphasis on lowcountry cuisine. The extensive kids' menu covers the usual burgers/grilled cheese/chicken tender options as well as Mahi Mahi, roast porklion and crunchy whole-wheat macaroni and cheese. (Healthy options are designated on the menu.) Tuesday is family night here, where kids 12 and under have their own dinner buffet and can create their own dessert as a local magician walks around performing magic tricks. The restaurant is open only from Memorial Day through the end of September. This combination coffee shop and sandwich deli also sells beach toys, local gifts, wine and prepared meals you can heat up in your kitchenette. You can grab a table inside or out or take your food to go. It's open daily year-round from 7 a.m. until 9 p.m. Located next to the golf shop and near the swim and tennis centers, the deli offers coffee, pizza, salads and sandwiches, which they'll even deliver during the high season. The deli is open year-round for breakfast and lunch from Wednesdays through Sundays. The open-air cafe is at the end of the resort's boardwalk, overlooking the beach. Its sandwich and snack menu is available for lunch and dinner during the summer only. Located at the Links Course Clubhouse, this diner-style restaurant features all the southern favorites. The spa offers massage, hair and nail treatments, and a full menu of body treatments, including the 50-minute warm lava shell massage (similar to a hot stone massage but uses smooth tiger-striped clam shells filled with a heated gel) and the 25-minute Shirodharra treatment (where a steady stream of fragrant oil is poured slowly on your forehead and hair). Kids' Spa programs for ages 9 and under include the Bee a Princess facial (featuring Burt's Bees products), Little Miss Manicure, Princess Pedicure and the ultimate: This Little Piggy, a manicure and pedicure plus a little piggy pillow. During summer Saturdays, the Little Girls Spa Camp (for ages 5 to 8) includes a manicure and pedicure, a facial mask complete with cucumbers and a craft activity (decorating your own pedicure slippers). Teen girls will drool over the 80-minute Chocolate Honey Cake, a body scrub using locally made honey followed by a mocha body mask. The summer-only, weeklong Island Adventures VIP Club Pass includes a color-your-own beach tote with markers, an Island Adventures T-shirt (for a tie dyeing activity), unlimited crafts and activities, including admission into all night activities (excludes Bingo and Teen Night). Available at any resort outlet, the cards act like debit cards for goods and services available at the resort. They're great gifts from grandparents or even a good way to give older kids a vacation "allowance." There's no fee to buy the card or to load it, and you can reload it as often as you want. Summer is, of course, the peak season here. The first week in August is Kids' Week at Wild Dunes, which means five days of even more special fun for kids (including animal shows put on by the South Carolina Aquarium and the Center for Birds of Prey). The week ends with a big KidsFest party on Friday, featuring games, an inflatable waterslide, food and prizes. While many offerings are closed in the off-season, Wild Dunes is indeed open year-round and offers the best bargains from October through January. This is when the resort is the least crowded and you can enjoy crisp-weather walks on the beach and also go into Charleston. Over the holidays, look for memorable special touches like elf tuck-ins, stockings delivered by Santa's helpers, and other seasonal specialties. 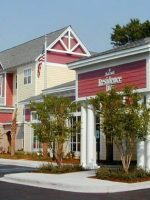 The Charleston International Airport is a 30-minute drive from the resort. Although Wild Dunes doesn't offer a free shuttle, the resort can arrange transportation if you fly in and don't want to rent a car. Walking or bicycling around the resort is easy to do. Hire a sitter and book the Champagne Sunset Paddle for Couples Only, which the resort arranges through Nature Adventure Outfitters on Shem Creek. This excursion takes you on a guided two-hour kayak paddle through the saltwater marshes with a brief stop for a little bubbly. Or try the Serena Sunset Sail aboard a romantic 50-foot yacht.